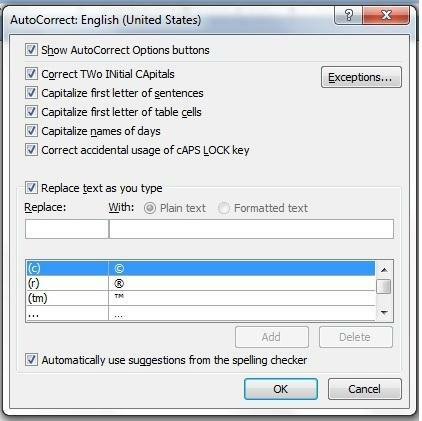 You can save time and avoid mis-typing difficult words like strange and unpronounceable character and place names with a feature in Microsoft Word and OneNote called AutoCorrect. Other word processors may have a similar capability. In Word and OneNote, the icon is a little lightning bolt. It’s under the tools menu in OneNote, but harder to find in Word 2007. I use AutoCorrect like shorthand for character names, but it works for phrases too. When I type the first letter of a character name, like M, the letter is immediately replaced with the name I’ve entered in the AutoCorrect options dictionary: Morningstar. If I have several characters or place names that start with M, I can create other abbreviations: Mb, Mx, Mfg. If I don’t have dozens, my shortcuts are not hard to remember. The AutoCorrect feature is easy to find in OneNote. It’s on the “Tools” menu at the top of every page. It’s harder to get to in Word 2007, but you can add the icon to the top bar. More about that later. Near the bottom of the options box is a scrolling list of the current dictionary entries. Above that scrolling list is a “Replace” field and a “With” field. If I type H in the “Replace” field and Hramxtvm in the “With” field, my correction is added to the dictionary. The AutoCorrect option is on the tools menu of older versions of Word, but in the 2007 version you locate it through the “Office Button” at the top left of the document screen. From there you go down to the bottom bar of that menu to “Word Options.” The full path is Office Button/Word Options/Proofing/Auto Correct Options. If I’m making a lot of AutoCorrect entries, that path is a pain. But Word gives us the ability to put our favorite icon short-cuts on the toolbar. To get the AutoCorrect icon up front once and for all, follow this path: Office Button/Word Options/Customize/Choose Commands From (a drop-down menu)/Commands not on the Ribbon/Auto Correct Options. Highlight “Auto Correct Options, click on the “Add” button, and the lightning bolt symbol will pop over to the box on the right. Click OK. Your AutoCorrect symbol should now appear on the very top bar of a Word page and be available whether you’re in the Review pane, Home, Page Layout, etc. When you’ve finished a project, you may want to remove the entries in your AutoCorrect dictionary. Just scroll through the dictionary and remove or replace them. Otherwise your old characters may show up in your new book. But wait–that might be a good thing. Awesome tip. Thanks for sharing! Just a thought, to add to the excellent advice…If you want to avoid auto-corrections popping up where they aren't wanted (like every time you type a word starting with M) you can choose an easy-to-type but little-used character on your keyboard as a prefix. So, for example, all your custom "replace" entries might start with "/" e.g. "/m". That way, the autocorrect feature will only kick in when you want it to. Botanist, intersting suggestion. In my experience, autocorrect only kicks in if I space after the shortcut. In other words, I don't get "Morningstar" when I type the M in Mary. Thanks, Diane, Botanist, & Anna, for your contributions here.Yeah, Anna, I think it does save time. With all those words we type, we need something to cut us a break.I read part of a YA novel by Ardyth on CritiqueCircle that had a dozen or more unique and unpronounceable names. I need to ask her if AutoCorrect helped her with that. Erm… actually I just memorized them all. *looks innocent* Or used copy/paste for the really terrible ones. Auto-correct is a good idea and likely would have saved time. Perhaps I'll use it for the sequel.